I was born in Kherson oblast in Russia, in the large town of Novaya Mayachka, on December 19, 1926. In times past this area was known as Nikolaevskaya. But my grandfather loved to called it Tavricheskaya guberniya. Novaya Mayachka is about 50-60 kilometers north of Crimea. My father’s name was Mikhail Gamanovich, and my mother’s was Liudmila, nee Martynova. I was named Nicholas. I was the oldest child, and had three brothers and two sisters. My father was a blacksmith by profession. He and his brother learned the craft from their father, Daniil, who owned a smithy where they all worked. My grandfather was also a carpenter. My grandfather had a brother, Yakov, also a blacksmith and carpenter who also painted icons. Our family had a half-length icon of the Savior that he painted. The face and hands were painted in oil, and the rest—the clothing, background and flowers around the border—were made of metal foil. Truth be told, I don’t actually like foil oklady. Metal is not an appropriate material for icons, being too soft. This was during Stalin’s reign. Soon, collectivization began as well as the raskulachyvaniye [dispossession of the kulaks—the wealthy peasant class—transl.] with all of Stalin’s wrath. My grandparents were wealthy and so were subject to persecution. For some reason he was imprisoned, where he soon died—his heart gave out. My father’s father, Daniil, could not eke out a living and so escaped unharmed, but his brother was more successful and suffered for it. The local townsfolk respected him, and warned him: “Leave quickly, go somewhere, abandon your splendid home, and we’ll just say that you were raskulachen.” He did as they suggested, and moved to the town of Podokalinovka, finding work there as a blacksmith, and lived there until his death. By then it was impossible to still own your own blacksmith, and so the family scattered. We lived in three towns after I was born. The last of these was Fedorovka (which no longer exists). There was only a four-year school in town. For further education, we had to go to the neighboring town, Kucheryavo- Volodimirovka, where there was an 8-year school (almost middle-school level). They taught in Ukrainian, but they also taught Russian language and literature. First we lived on one bank of the Dniepr River, for a year, then the other… We often moved to different towns, wherever we could make do. I started school at the time. I would begin the school year in one village, then finish the year in another. And then came the war. It began on June 22, and by August, the Germans had arrived. They invaded quickly, since there were no natural defenses, only the Dniepr River… It was hard to resist such a sudden and powerful blow. The German Army was well organized, well-armed, and had talented generals with WWI experience. The onslaught was great, the front quickly moved east. It was calm where we were, there were no partisans, since there was no place to hide, for the land there is flat with no forests. Soon the Germans began to collect workers for Germany. They promised that we would have a good living and decent working conditions. Many took the bait, and the first group was made up of volunteers. But soon word came that their conditions were actually very bad. No one then wished to go voluntarily. The Germans then began to take people by force. The village elders would be told how many people they needed, and that is how I ended up among them. The people were put in rail cars and sent to Germany. We traveled for two weeks with brief pauses. We were taken to Berlin, and from their divided up. Among us were women, who were sent to a women’s camp, and the men sent to men’s camps. They were surrounded with barbed wire, and the entrances had guard booths. Everyone from our village was in one camp together. Among those who were already there were people from Odessa and Harkov. They said that they were very badly fed, and that half of them died. I remember the address: it was Berlin, Neukolln, Russenlager 4. Our days began at 5 am. Usually, a police officer would charge into the barracks with a rubber crop, and shouted for everyone to rise. If anyone tarried, the rubber crop would be used to hurry them up. The policeman was a Russian worker with a kerchief tied around his arm. He clearly tried to earn points with the Germans. There were two fifteen-year-old boys with us. They would wet their beds, probably from exhaustion. We slept in bunk beds. The person in charge of our barracks assigned them a bunk bed and had them change places every night, so that they would wet each other on alternative nights, expecting that this would “cure” them of exhaustion. We received 300 grams of bread for breakfast, a teaspoon of sugar, a thin square of margarine, sometimes a thin disc of artificial sausage and tea. We would then be lined up, counted and escorted by a policeman (the Russian with the kerchief) to work. It was an automobile factory. At the end of the day, we were lined up again, counted, and sent back with the policeman. We were then given a thin broth, camp soup. This included rutabaga, cabbage, a bit of potato and kohlrabi. The combination varied, with the kohlrabi overripe and stringy. I spent about two months in this camp. The commandant was apparently a Russian German. Once he visited the victory and entered the section where I worked. We were applying some kind of hard cardboard to a framework for van walls. For some reason the commandant noticed me, probably because I was dragging my feet. He asked my name and wrote it down. Shortly thereafter, another fellow and I were sent to the dispatcher (Arbeitsamt). From there, two fellows and I were taken by some proprietor—he had a parcel of land, about 1 hectare, and a small house on the outskirts of Berlin. We were put up in this house. We were instructed to till the land between some trees and plant vegetables. I was about 16 years old, and my companions were about three years older. I didn’t have a good idea about how to work the land, and they knew better, in general, we did pretty well. Compared to the camp, we were much better off. There was no barbed wire, we got grocery cards, and on Sundays I could even attend church. Things could have been better, but the other fellows were not of the best character. One of them wasn’t so bad, but the other was an orphan, and they were not averse to taking advantage of the fact that we weren’t being supervised. We had to work from 7 am to 5 pm with a lunch break. The guys decided “If the owner doesn’t come right away, we can sleep late.” But he did come and threatened us through the window. He then decided that he wasn’t going to get an honest day’s work out of us. We worked for two months, after which he sent us back to the Arbeitsamt. From there, I was sent with my companions, I think, to a work camp to work on graves. This camp was next to a cemetery, surrounded by wooden fences, 6-7 feet high. The same wall surrounded the camp, and the entrance was guarded, but not as carefully as the previous camp. The camp consisted of two barracks; workers lived in one, the other contained the office and cafeteria. This was in Berlin, Neukolln 2, Hermanstrasse 84/90. There were about 100 workers there. We tended to some 30 or so cemeteries, two or three workers were assigned to each, and given money to travel there on our own. At the cemeteries, we dug graves for burials, usually on Wednesdays and Fridays, mowed the grass, tended to wreaths, swept up, etc. Since we would travel to work alone, we were lucky. Work ended at 5 pm, and we had to return to the camp no later than 8. There was plenty of time to commute, so we had time to kill. I was a village boy. Seeing how naive I was, the older fellows would tease me. “You know, I was digging a grave, and suddenly a corpse from the next grave snatched by foot! I hit his arm with my shovel, and kept on working…” They would be so nonchalant that I didn’t know whether to believe them or not. Then I realized what they were doing and went back to work. That was in 1943. From 1944, the Americans and British began bombing Berlin, and as time went on, these became more frequent and more intensive, especially towards the end of the year and in early 1945. They grew bolder, and bombings occurred not only at night but during the day, without targeting anything, just carpet-bombing. Our barracks were hit with incendiary bombs and burned down. The workers were at work in their cemeteries at the time. We were moved to the barracks-cafeteria, but there wasn’t enough room for everyone. Some workers spent nights in the cemetery where they worked, and came to the base camp for meals. Camp life was completely disrupted: the guard booth was abandoned. The bosses only came for the day. We felt much more freedom. I read an announcement in the Russian paper that Archimandrite Ioann (Shakhovskoy) would lead religious discussions on Wednesdays and Fridays at the church on Nachotstrasse. I tried to come on a Friday. There was no discussion. There was a moleben, however, and Fr Ioann gave a farewell speech. Soviet soldiers were approaching Berlin and they needed to quickly move west. I approached a table where there were lithographic icons for sale. Next to it was a hieromonk named Kyprian. He began talking to me and we struck up a discussion. When I entered the church, I kissed a few icons, making prostrations before them first—this showed that I was at least somewhat religious, and so he noticed me and said “You would do well as a monk.” I responded that I had thought about that for a long time, but did not know how. My grandfather had had religious books: the Lives of Saints, a prayer book and a few others. The Lives of Saints made a deep impression on me, and they brought back my faith in God. Of course, I had been baptized as a child and was somewhat religious, but life in the Soviet Union and its propaganda left their mark. I loved to read about the life of monks in the monastery, and I desired to follow that path myself. Fr Kyprian suggested I visit the temporary home of his monastic brethren: “Let’s go, see how we live.” I spent the evening there and told Fr Kyprian that I wished to join. He took me to see the abbot, Archimandrite Seraphim, and interceded on my behalf. The reverend abbot first refused: “We don’t know ourselves what is to be with us, how are we to take in a young man for such a serious undertaking?” But later he agreed. On Sunday, saying nothing to anyone for safety’s sake, I left the camp and joined the monastic Brotherhood of St Job of Pochaev—this was February 3, 1945. After the capitulation of Germany the Brotherhood moved at first to Geneva, and from there, on November 13/26, 1946, arrived in the United States of America, to live in Holy Trinity Monastery, which had been founded by Archimandrite Panteliemon with the blessing and with the support of Archbishop Vitaly (Maximenko). In Geneva, before leaving for the United States, Nicholas was tonsured as a Riasaphore Monk with the name of Alypy. At Holy Trinity Monastery Fr. Alypy carried out various obediences in equality with the other brothers. However, his main work was in the icon studio where he worked under the guidance of the aforementioned Fr. Kyprian, the foremost iconographer of the Russian immigration. In 1948, together with two other novices (the later Metropolitan Laurus and Archimandrite Flor) he was tonsured to the small schema by Archbishop Vitaly (Maximenko). After completing his seminary education at the monastery, Fr. Alypy taught several subjects at the Holy Trinity Seminary: Church Slavonic, Greek, The History of the Russian Church, and others. As a result of his teaching efforts Fr. Alypy published a Grammar of the Church Slavonic Language, first published in 1964, reprinted in 1984, and translated into and published in English in 2001. In 1950 Fr. 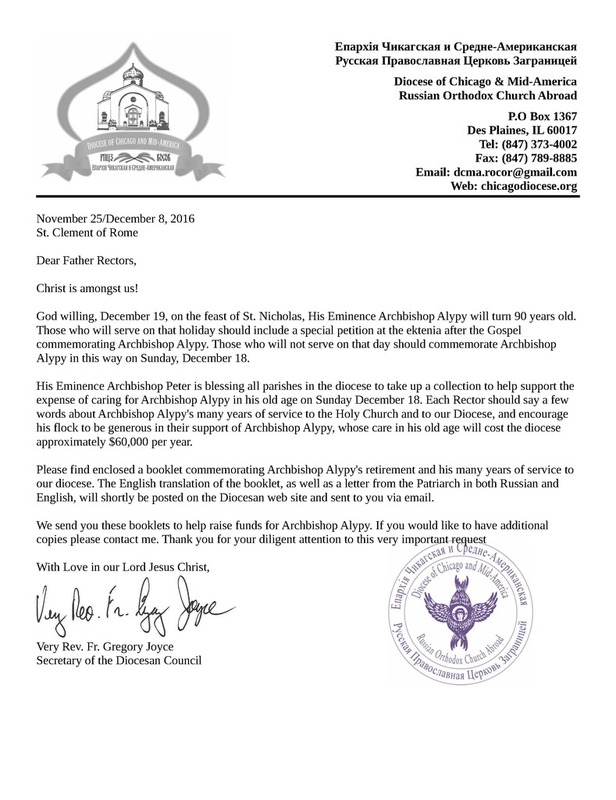 Alypy was ordained a Hierodeacon by His Beatitude Metropolitan Anastasy, and in 1954 a Hieromonk. On October 7/20, 1974, with the participation of Metropolitan Philaret, Archbishop Seraphim, Archbishop Vitaly, and Bishop Laurus, Archimandrite Alypy was consecrated as Bishop of Cleveland, Vicar of the Chicago & Detroit diocese of the Russian Orthodox Church Abroad. Following the repose of Archbishop Serahim (Ivanov) in 1987, Vladyka Alypy was appointed the ruling hierarch of the diocese. In 1990 he was raised to the order of Archbishop. In 1994 he was transferred to the Australia-New Zealand diocese, however, due to concerns about his health the Australian consulate delayed their decision about whether to accept him, and in the interim, at the intercession of the parishioners of the Protection Cathedral in Chicago he was returned to his previous position. While fulfilling his duties to the diocese, Vladyka Alypy did not forget his work as an iconographer. His Eminence at this time completed the frescoing of the St. Sergius Cathedral in Cleveland. During Great Lent of 2002, in the garden of the diocesan cathedral, Vladyka fell and hit his head on the asphalt. As a result of this he received an injury which deprived him of his ability to move independently. In order to help Vladyka, in 2003 Archimandrite Peter (Loukianoff), former Head of the Russian Ecclesiastical Mission in Jerusalem, was consecrated as Bishop of Cleveland. In June of 2016, due to his ill health, Vladyka Alypy was granted retirement by the Hierarchal Synod. On behalf of the Synod of Bishops I wholeheartedly welcome you, our longest standing archbishop and bearer of the spirit of the famous Job of Pochaev brethren of Ladomir, with kind good wishes for good health and divine assistance! With this letter I announce with great joy that the Synod of Bishops has determined in this momentous year, with all due solemnity mark your upcoming ninetieth birthday. Longevity is the gift of God and a special mark of His beneficence. During these days of the gathering of the Synod of Bishops, dedicated to the fiftieth anniversary of the repose of St John the Wonderworker and Archbishop of Shanghai and San Francisco the Miracle-worker, when we commemorate you in prayer at the shrine of the incorruptible and multicurative relics of this wonderful patron of the Russian diaspora, the words of the prophet Jeremiah especially resonate: "Blessed is the man who trusts in the Lord." You have used this text in your life. This is the foundation on which your Church glory grew and multiplied as a sign of God's blessing on your life and archpastoral works. You expressed this faithfulness to the Lord in your monastic tonsure in the pronunciation of the special vows dedicating your entire life to the Church of Christ. This trust in divine care and help from God openned your heart during your induction speech at your consecration as a bishop. In 1974, through the grace of the Holy and Life-giving Trinity, through the election of bishops and the appraisal of the bishops of the Russian Orthodox Church, through the prayers of Metropolitan Filaret of holy memory (Voznesensky) and the host of hierarchs, the Lord, from His Paternal and Divine profundity poured out upon you a special blessing of the Holy Spirit and Comforter so that within you there might be the strength and apostolic zeal to follow the way of Divine Providence, denying yourself and taking up your cross, and preach the Gospel of Love, addressed to the whole human race, in the vast Diocese of Mid-America, for which you built and beautified the majestic Cathedral of the Protection of the Theotokos. Bowing down to Earth and expressing our most profound gratitude for the many years of assiduous service to the Church and the People of God, the Synod of Bishops blesses your well-deserved rest, determining that you are to remain on leave, with the right to stay in the Bishops' house in Chicago as a dependent of the diocese to which you gave all your strength. We thank you for the fact that you have prepared for yourself a worthy successor in the person of Peter Bishop, who has been raised to the rank of archbishop at this meeting. 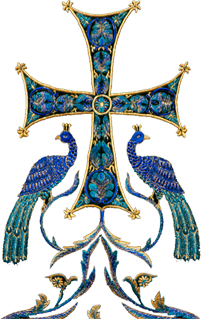 We thank you for generosity of your love and faithfulness to the Russian Orthodox Church, and we ask for your holy prayers for us, your brothers and concelebrants. Modern man, trying to renew his life, comes to the conclusion that it is necessary to return to traditional values. In the twentieth century century, we once again are trying to restore bit by bit the precious stockpile of the past, which was thoughtlessly wasted in the course of technical and social revolutions in the various reforms in the pursuit of material goods and in our everyday life. One of these treasures is the Church Slavonic language. Saints Cyril and Methodius, enlighteners of the Slavs, originally created this language as a means to communicate with God. Church Slavonic was the language of Scripture and chanted prayers, of spiritual poetry and theological thought. In our time, while remaining the language worship, it marvelessly retains its original purity and sanctity accumulated by the Church over many centuries. In order to truly connect to this ancient source of holiness and wisdom so that one not only perceives the Church services with the ears alone, but to understand with the mind and feel with the heart one needs to study Church Slavonic. To this end Hieromonk. Alypy's (Gamanovich) A Grammar of Church Slavonic provides invaluable assistance. The textbook contains a historical overview of the development and formation of Church Slavonic, an explanation of the grammatical and syntactical aspects of the language and provides many and varied examples from Scripture and liturgical books. These are particularly valuable because they help learn Church Slavonic not in the abstract, but in the context of the liturgical tradition of the Orthodox Church. In presenting the material, the author often draws parallels with ancient Greek, English and German and in some cases refers to Hebrew, reflecting the biblical tradition of the Old Testament. The fundamental nature of this work combines with the accessibility of its explanations, and makes the book of interest both for professional philologists and theologians, as well as for those who are just beginning the path of becoming churched and have no special training. This textbook was first published in 1964 in Jordanville, NY (USA), and has been reprinted many times. To this day it is by far the best textbook for Church Slavonic. In 1964, in Jordanville, NY (USA) one of the best textbooks of the Church Slavonic language was published. Its author was a monk (later Archbishop)Alypy (Gamanovich). The textbook was a reflection of the course of lectures on the Church Slavonic language, read by the author at Jordanville Holy Trinity Seminary. In the preface to A Grammar of Church Slavonic, the author wrote: "Due to the fact that the majority of Russians abroad have studied in foreign schools, for completeness sake we have introduced in this grammar a number of elementary facts which are generally known from Russian grammar. " Yes, for these purposes the idea of this textbook came about, to preserve the rich heritage of the liturgical language, to enable the seminary students to praise God not only in the usual English, but also not to lose the experience already gained by the Russian Orthodox Church. The simplicity and clarity of presentation made the textbook relevant and popular not only among foreign language students of the seminary in the United States,but also among students in Russia. The 1960s in Russia were not only the years of the conquest of space and the construction of five-story housing, but also years of a new persecution of the Church, years when the strength of each seminary and academy student and every future priest was tried. During these years the teaching of classical languages was virtually eliminated in the seminary system of education of the Russian Orthodox Church. But it was precisely at this time that those thirsting for knowledge could especially feel the value of the Word and the value of the Book, as well as the value of the languages of the Christian East, and, of course, the value of their native Slavic language. It was not possible in Russia at this time to freely buy a Bible or prayer book, not to mention Church Slavonic language textbooks ... On the shelves of the three remaining seminaries that had not been closed were mostly typewritten summaries of lectures of professors and teachers. There was no way to print textbooks. And what a joy it was for each student to hold a miraculously preserved pre-revolutionary textbook in even one of the disciplines. And then there were the new books that had by some miracle "leaked" through the "iron curtain" ... One of these was Alypy Gamanovich's book. As the years passed, the circumstances changed, but priest Alypy's textbook remained a basic textbook, by which generations of students of the Moscow Theological Academy and Seminary studied. Nowadays in the Library of the Moscow Theological Academy there are other Church Slavonic textbooks, there is a choice for teachers and students. but time has shown that the priest Alypy's (Gamanovich) textbook is still in demand. Of the more than two hundred textbooks currently housed in the study section of the library, more than one hundred are in regular circulation. A Grammar of Church Slavonic differs from other books in its profound churchliness, the classical clarity in its presentation of material without dryness or embellishment. The author derives fine examples from the texts of Scripture and liturgical traditions. When using the textbook and when doing lessons based on it both in course of regular classroom lectures and independently, the sense of the author's lively approach and his deep sense of the elements Church Slavonic words is evident. The textbook is particularly modern in the sense that the author refers to contemporary literature of the related areas, in particular he has a special interest in Greek grammar of the New Testament. In this way, students of theological schools in Russia could and still do interact not just to a work, compiled by a professional philologist-Slavist, but to a work full of the best theologicl intuitions of theological scholarship. However, in the printed version of A Grammar, held in the Academy library there are clearly not enough exercises. Unfortunately, we do not have data on the second, practical, part of this textbook. But the examples given in the book, you can imagine how lively the author taught. A similar situation occurred with other courses as well. For example, on the nature of the teaching of the great connoisseur of classical philology and translator of the works of St. Isaac the Syrian Sergei Ivanovich Sobolev in the pre-revolutionary Moscow Theological Academy we can judge from the notes of his lectures, which were recorded by the "on-call" students in special student notebooks. The lack of exercises in this case fortuitously encouraged the teachers of Church Slavonic at the Academy to seek and propose their own creative options and anthologies. Written half a century ago, A Grammar remains current and modern. Moreover, it is a good example of a systematic grammar, compiled from very spirited material, relevant to the Orthodox Christian. Modern fields of science from time to time seek renewal and a radical revision of familiar, but not perfected coordinate systems. The grammar of Church Slavonic, at the level of religious education is beyond these tumultuous and often fruitless processes. It is like a ship rhythmically sailing on the waves of the sea of life, seeking piety and the spiritual edification of the soul. For Russia Church Slavonic is the language that opens the spiritual primary sources. It is easier to study any complex language than Church Slavonic, which by virtue of its special affinity to Russian turns out to be difficult for the modern Russian to comprehend. But all the more creativity is required of the teacher of the discipline, which should come to life in his mouth, and transform this audience. And even more art is required of the textbook, which, even without the teacher/author continues the noble cause of learning. Sobolewski wrote that in Russia a competent theologian can not do without the Ancient Greek language, any ore than a literate Christian can do without standard Russian. But where is the place of Church Slavonic? As a calque of Greek, on the one hand, and a living forerunner of the Russian language, on the other hand, it takes its unique place in the formation of a genuine Russian spiritual culture. Finally, in order to comprehend the lesson, one needs to absorb each word and deeply master it. At the first reading of the pages of Hieromonk Alypy's textbook there is a feeling of some heaviness. But it is a false feeling. With a more thoughtful reading we find ourselves very simply in a pre- revolutionary era, but much more modernly presented. Thus, Hieromonk Alypy's textbook became not only a pleasant exception among a number of textbooks of the 1960s, but a rule, because many other subjects in the theological and church-historical cycle were taught in those years at the Moscow Theological Academy from notes made by teachers and graduates of the pre-revolutionary Theological Academy. Hieromonk Alypy's A Grammar Church Slavonic is also one of the bridges, which helped maintain the continuity with pre-revolutionary Russia and preserve the Russian spiritual culture for future generations. About his Church Slavonic textbook His Grace Alypy himself wrote the following: "Even before the classes in the seminary, I was fond of Church Slavonic. When this subject was taught to us in the seminary, I tried not to miss anything, and it was taught us by Archpriest Mikhail Pomazansky, a highly educated person. He had graduated from the Kiev Theological Academy and had a real feel for grammar and presented it skillfully. He taught us Greek as well, and some other subjects. "After graduating from the seminary and obtaining my certificate I was asked to teach Church Slavonic. "As a result of teaching for a few years I drafted A Grammar Church Slavonic. Holy Trinity Monastery published it in 1964. A second edition, with some amendments came out in 1984. Archpriest John Shaw translated my grammar into English, and it was published by Holy Trinity Monastery in 2001. In the English version I made some more amendments. Father John speaks several languages, and therefore was able to cope with this very difficult task. Many thanks to him. "I was very pleased to learn that my grammar and was found useful in Russia. In Russia there were, it seems, two reprints: in the 90s a reprint of the first, 1964, edition appeared. I was a little upset, because the 1984 edition was significantly better. I had improved some things and added others.... But it was explained to me that in 1964 there was no copyright law, and therefore this option was chosen, so that I would not be able to submit any claims. But I wasn't thinking to quarrel with anyone. On the contrary, I am very glad that my book has come in handy, that it is used, that it has found its readers ... "